« Can the Dead Be Defamed? I get many calls from victims of Internet defamation who want me to go to court and get an order to stop the defamation. In other words, they want a court order that stops someone from speaking or publishing statements that the victims deems to be defamatory. Is that possible? California law is very clear that after a trial has determined that the statements being made are defamatory, the court can order the defendant to stop making those statements. The reason is that defamatory speech is not protected, so once it has been found to be defamatory, the court can order the defendant not to repeat the defamatory statements. Once the court has issued such an order, it can be enforced just like any other court order, with the court assessing sanctions and even jail time if the defendant refuses to comply. The much tougher challenge is getting a court to order a defendant to stop defaming the victim before there has been a trial. Typically, it takes at least a year to take a matter to trial, and that may be far too long for the victim. A temporary injunction can be obtained in a matter of days, so that affords a much faster remedy if it is available. But there is a problem. An injunction is usually issued with little or no time for the defendant to oppose it. The procedure is that the plaintiff files an ex parte application with just 24 hours notice to the other side. The plaintiff’s attorney may have taken weeks to prepare a carefully crafted application supported by any number of declarations from witnesses, but the defendant gets just 24 hours to put together an opposition. Indeed, it’s far worse, because notice must be given 24 hours in advance, but the application may not be served until just four hours before the hearing, depending on the procedure followed by a particular court. If good cause can be shown, the ex parte application can be sought with no notice to the other side. A defendant could be ordered to stop speaking before the judge has ever heard his side of the story. Is that fair? To make the system a little more fair, the first order that is issued by the court is only temporary, hence the name Temporary Restraining Order (“TRO”). As a part of issuing the TRO, the court must also set a hearing about ten days later, to determine if a Preliminary Injunction will be issued. In other words, the court issues a TRO pretty much based only on the plaintiff’s version of the facts, but that order is only good for about ten days, at which time the defendant gets to file his papers opposing the Preliminary Injunction. 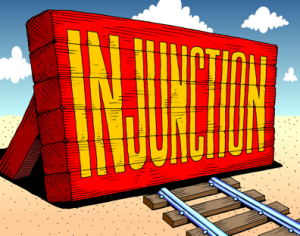 Why is it called a “Preliminary Injunction”? Because, as the name implies, it is a “preliminary” injunction that is in effect only until the matter can be decided at trial. If the plaintiff proves his case at trial, the injunction then becomes a “Permanent Injunction”. (That name is a little misleading, because by its terms the Permanent Injunction may only be limited to a given length of time.) If the plaintiff does not prove his case at trial, then the injunction is extinguished. The point of this long-winded explanation is that, as you can see, a TRO and Preliminary Injunction are both issued without the benefit of trial. They are usually supported only by signed declarations, and the defendant has no opportunity to cross-examine those witnesses. We cherish the right of free speech in this Country, and a judge should not be ordering someone not to speak before he or she has seen all the evidence, and the defendant has had the right to face his accusers (more of a criminal concept, but the reasoning still applies). For this reason, the courts have long held that any order that prevents someone from speaking, before trial, is a prior restraint and is unconstitutional. Therefore, most attorneys will tell you that it is impossible to get a restraining order to stop a defamer before trial. But it isn’t necessarily so. The recent unpublished opinion in Burrett v. Rogers illustrates a narrow exception, arising from the tension between the right of free speech and the right not to be harassed. The trial court denied that part of the TRO request, finding it was unconstitutional prior restraint, and set the matter for a hearing on the Preliminary Injunction. (The court also refused to order Rogers not to attend plaintiff’s church.) Rogers filed an extensive opposition to the requested injunction. After the hearing on the Preliminary Injunction, at which Burrett and Rogers both testified, the trial court issued the injunction, and ordered Rogers have “no social media harassment with family names”. Rogers appealed, claiming this amounted to unconstitutional prior restraint. The civil harassment restraining order in this case, unlike the injunction in Evans v. Evans, does not enjoin publication of false and defamatory statements. The civil harassment restraining order is constitutional because it enjoins harassment on social media Web sites. Harassment, which is not protected speech, is defined in section 527.6, subdivision (b)(3). As you can see, the holding is very narrow and will only apply where a plaintiff is seeking a very specific type of injunction, but it is possible through the use of an injunction against HARASSMENT as opposed to the defamation itself, even though the harassment may be taking the form of harassment. 6 Responses to Can a Court Order Someone Not to Defame You? Very helpful point about obtaining a preliminary injunction against a defamer. thank you. Great article. For years I thought that you could never get an injunction to prevent someone from saying whatever they wanted on social media. It seems that if the court finds the postings to be harassment now the court can enjoin the postings. Thanks for clearing this up. I don’t know the answer to the question but I am putting it out there. Isn’t it possible that “Directed at a specific person” means that the victim is simply the target of the harassment, not the direct recipient of the statements? If I post defamatory statements about Michael Mishlove all over the internet but fail to tag you, or email you directly, haven’t I “directed” my comments toward you? That’s how I read this statute until I read your comments. Like I said, I don’t know the answer and I can’t find any authority supporting either interpretation. >> Isn’t it possible that “Directed at a specific person” means that the victim is simply the target of the harassment, not the direct recipient of the statements? I’m not totally clear on what you are asking. A statement must be “about” someone to be defamatory, but it need not be directed to them. If you make a defamatory statement to a group, and the target of your statement is not present, that doesn’t make it any less defamatory. Aaron Morris, he’s asking about the language provided in CCP 527.6 for Civil Harassment. Your answer pertains instead to the tort action of Defamation.